Now that the holidays are over, I am in need of some Thank you cards. Something that I do not have in my stash. With a few visits to some challenages, I was able to get cards prepped and ready for the postman! I used the fun flowers for the Big Shot, cut them in white, and sponged the ends with Pool Party. I used the dimensionals, and layered them together. The silver glimmer is a great a great addition to the card, without going over the top. 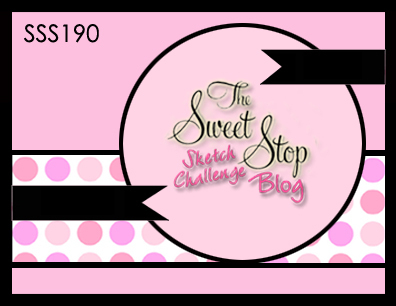 I used the colors from the Create with Connie & Mary challenge, and the sketch from Sweet Stop. Wow!! This is really beautiful! Love the sponged flower! Adds a touch of softness! And the silver center is perfect! Thanks for playing the challenge at Create with Connie and Mary! Oh, how pretty Chera. 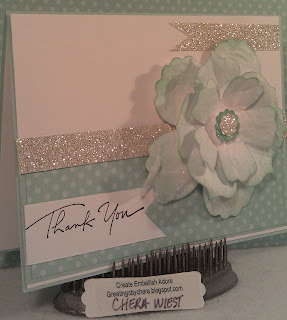 Love the pretty layered flower and the glittery strips. Great take on the sketch. Thank you for playing along with us at The Sweet Stop this week. Wow this is a really pretty card! You combined the color challenge and the sketch challenge to make a gorgeous creation! Thanks so much for joining us at Create with Connie & Mary. Love that flower and the font on that thank you is awesome!! Your flower truly looks like silk! Love the sponging! Just a quick note, would you mind checking your settings and changing the word verification to "off". The design team has an awful time trying to leave comments with the additional step. We are trying to ask everyone who participates to help us out! So glad you joined us this week at Create with Connie & Mary and Happy New Year! The paper flowers are so pretty with the sponged edges. Thanks for playing the Create with Connie & Mary Challenge this week! Very Pretty! Good idea to stock up on Thank You cards. I need to sort through all my cards and get them organized. I'm so glad you joined our color challenge this week at Create with Connie & Mary! Oh my....so soft and pretty! I just LOVE the look of your soft flower on this card with the sparkle! BEAUTIFUL! Thanks for playing along in the Create with Connie and Mary Thursday Challenge! Oh Chera this is really beautiful! 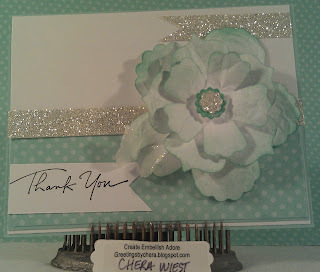 I love how you've incorporated the silver glimmer paper and your flower is just fabulous! Such a lovely card. Thanks for joining us this week at Create with Connie & Mary! 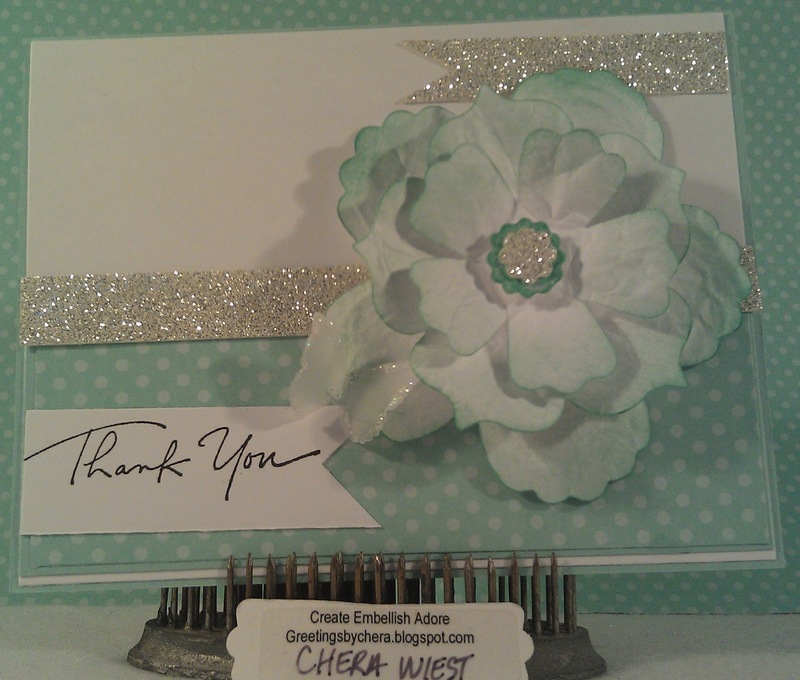 Oh, love combining the Silver Glimmer with the flower...gorgeous card! The flower looks almost real! Thanks for playing along with the color challenge this week on Create with Connie and Mary!